About: Empty Bowls Virginia Peninsula is engaged in a grass­roots effort to raise both money and awareness in the fight against hunger in our local communities. The project was initiated by a Michigan art teacher in 1990 as a way to raise charitable funds for his community. His idea spread, and Empty Bowls events now take place across the United States and in at least a dozen other countries. Millions of dollars have been raised and donated to hunger fighting organizations. Empty Bowls Committee: The EBVP Committee is the energy and organization behind this event. It is completely volunteer driven. Our committee members give their time and talent to a variety of activities: recruiting food and beverage donors; designing graphics and publicity materials, maintaining our Facebook page and web site; ticket sales, volunteer recruitment, organization, and bowl artistry. 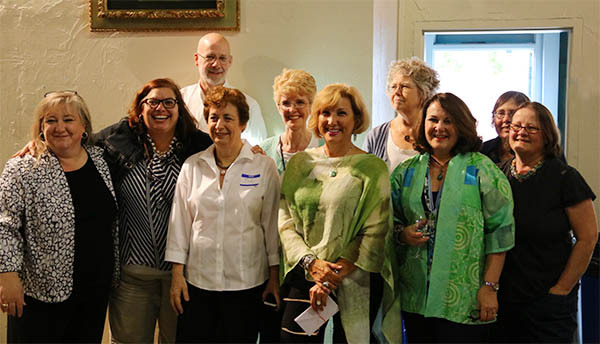 Our Story: In 2011, a committee of five enthusiastic volunteers first met to discuss hosting an Empty Bowls event on the Virginia Peninsula. As plans for the fundraiser developed, the committee grew to over 50 volunteers for our first event. 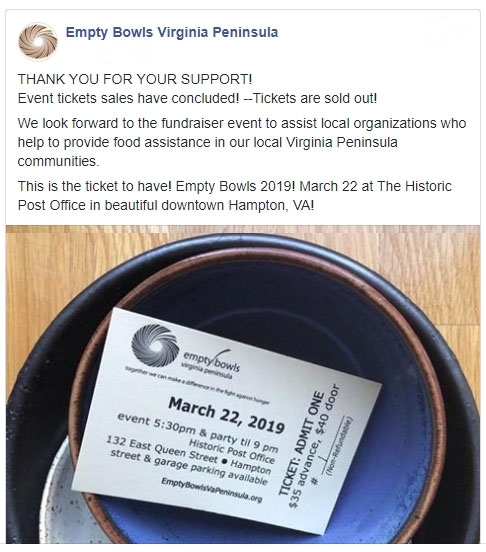 In the summer of 2012, we incorporated as Empty Bowls Virginia Peninsula, Inc., and received designation as a 501(c)(3) organization shortly thereafter. Donations to Empty Bowls Virginia Peninsula, Inc., are tax-deductible retroactive to our date of incorporation (September 14, 2012).